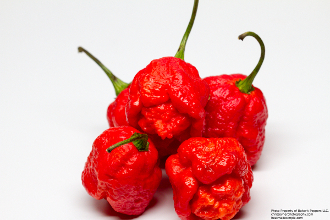 Here we have available 7 Pot Brain Strain Red seeds! They come 20+ per pack. The plants grow from seed to harvest in 160 days. These Peppers will ripen from green to red! They are very fun to grow and make GREAT hot sauce!! Roughly 1.3 Million SHU rating! Order yours today!! This pepper was developed by David Cappiello.